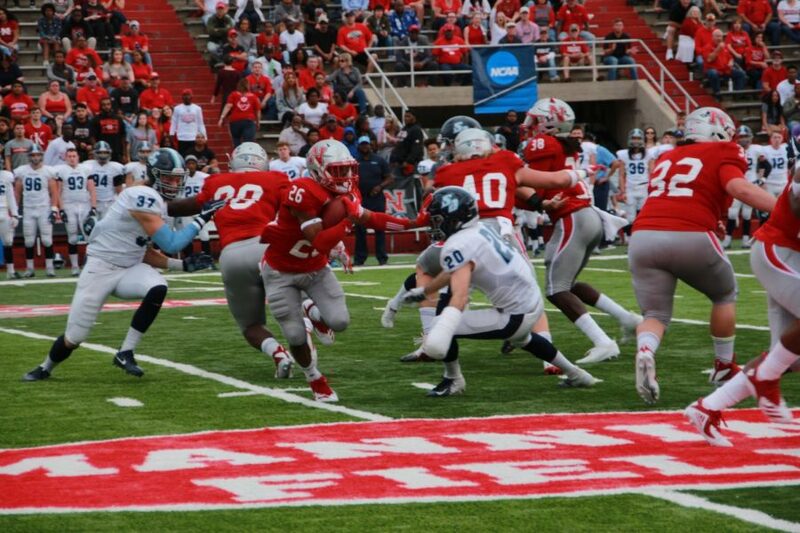 In the first round of the 2018 FCS Playoffs, the Colonels won against the San Diego University Toreros with a score of 49-30 at John L. Guidry Stadium this past Saturday. The Nicholls State University football team avenged its 38-31 defeat last season in the first round of the 2017 FCS Playoffs to the University of South Dakota Coyotes. In Saturday’s game, Nicholls gained 606 yards of offense and held San Diego to only nine rushing yards. The Colonels (9-3) started off fast with two touchdown runs of 27 and 49 yards from junior running back Dontrell Taylor. Junior quarterback Chase Fourcade also ran for a score from 19 yards out to give Nicholls a 21-7 lead at the end of the first quarter. Next, freshman running back Julien Gums punched the football into the end zone for a one-yard touchdown run to make the score 28-10. Fourcade then threw a 52-yard touchdown pass to redshirt sophomore wide receiver Tahj Smith to increase the lead to 35-10 going into the half. In the third quarter, senior wide receiver Damion Jeanpiere, Jr., hauled in a 17-yard touchdown pass from Fourcade to give the Colonels a 42-10 lead. But the Toreros fought back with 20 unanswered points to make the score 42-30. Toreros redshirt senior quarterback Anthony Lawrence finished the night completing 30 out of 56 passes for 322 yards and four touchdowns, all of which went to his tight end. San Diego had its most valuable receiver in freshman tight end Dalton Kincaid, who hauled in six passes for 87 yards and four touchdowns. But Fourcade would take it into the end zone himself once more, this time from 13 yards away, to make the score 49-30 and end the game. Fourcade finished the contest completing 21 of 31 passes for 337 yards, two touchdowns and an interception, and rushing for 15 times for 82 yards and two touchdowns. The 2018 Southland Conference Player of the Year needs just 89 yards to become the program’s all-time leader in passing yards, which is currently held by Colonels Hall of Fame quarterback Doug Hudson. But there was history made during this game at Manning Field. Nicholls won its first playoff game since its 28-26 win over the Appalachian State University Mountaineers in 1986. The Colonels earn another chance to play as they advance to the second round of the 2018 FCS Playoffs. They take on the Eastern Washington University Eagles Saturday at 4 p.m. on ESPN3.